Last night we had the pleasure of venturing to the Westside of Los Angeles to my alma mater, UCLA. 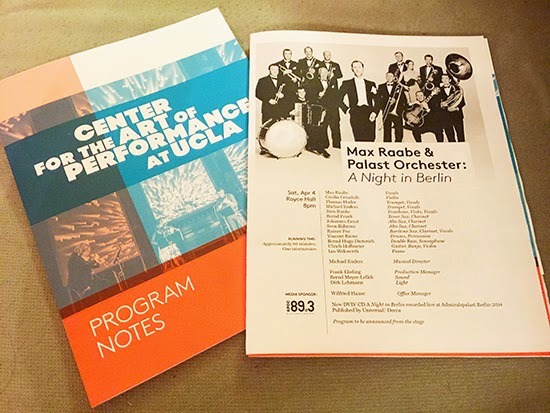 There we were able to see one of the great orchestras playing vintage music today – Max Raabe & Palast Orchester.Hailing from Germany, they make occasional annual West Coast forays so we may have the pleasure of hearing their unique and authentic version of 1920s and 1930s music. My husband had never heard them before and was skeptical at first, but Max’s droll, urbane and witty stage presence won him over. I wore a black 1930s crepe dress with silver buttons holding back the wide collar. It’s hard to tell in the photos, but the elbows come to a point. The vintage filigree necklace and matching earrings were a gift from a dear friend over 20 years ago. Should he ever come in to your town, I do recommend catching Max Raabe. Their style is a delight. That's a lovely outfit, and it sounds like a great event.